Welcome to the October 2012 edition of The Director's Dilemma. In this month's real life case study, we consider a not-for-profit board in the arts sector whose Chairman has overstepped his authority. Blind-sided in the eleventh hour by covert decision-making, Peter - as a non-executive director - has to quickly make sense of a calamitous series of events that now threaten the credibility and future viability of the organisation. Which response would you choose and why? Peter is a director of a not-for-profit company in the arts sector. A few months ago his organisation's funding was increased by 40%. The board and management were ecstatic. Shortly after the funding was announced the Chairman informed the board that he had authorised a staff member to change working arrangements and move to a part time role in other premises, reporting directly to the board. The CEO had been informed of this decision verbally immediately before the meeting and was clearly not happy. The grant funding application had stated that this role was full time and to be located in the head office and close to the government department to allow frequent liaison. At the end of that meeting the Chairman solicited dates for an 'in camera' (non-executive director only) board meeting which Peter attended a week or so later. At that meeting the Chairman discussed 'general staff discontent' and a need to restructure. Peter and a few colleagues asked why the CEO was not involved in this discussion. They were told he was too busy with day-to-day issues to think strategically. This seemed strange as the organisation was running well and Peter felt the CEO was capable of making a great strategic contribution. At the meeting the NEDs resolved to restructure and split the organisation into two parts; one would be headed by the part time staff member and one by the CEO. Peter asked that the CEO and staff member both present to the board before this decision was finalised but was overruled by the majority who wanted fast progress. Now the CEO has resigned and is taking leave. Worse, the organisation is rudderless with junior staff unable to operate either of the two new structures without the CEO's leadership. The Department is asking for explanations and threatening to cancel the funding. I think Peter has two problems. First, he should determine (i) what the provisions of the underlying statute says in his jurisdiction about a board and a Chairman's authority, and (ii) what the not-for-profit's charter and bylaws say with respect to the same. Secondly, if normal board process has been violated Peter must decide whether he wishes (i) to stay on the board and communicate his concerns to the Chairman or (ii) to resign. The law in most jurisdictions provides that the Chairman, CEO and other officers are elected by the Board, serve at the pleasure of the Board and are responsible for implementing the policies and guidelines established by the Board. In this case, the circumstances appear to have been turned upside down. The Chairman has taken it upon himself to modify significantly the roles and responsibilities of the CEO, to reorganize the entity's management structure and to inform the non-executive board members after the fact. The "in camera" (NED only) meeting called by the Chairman is a lame attempt to justify his actions, possibly on the basis that it is easier to beg forgiveness than to ask permission. In my view, the Chairman's behavior is a certain formula for blind-siding the NEDs and other directors, and potentially exposes them to personal liability where indemnification may not be available. For example, could the public authority seek repayment of the recent grant to the entity or penalize the entity or the directors based on a theory that the management structure of the organization was misrepresented? Peter should ask his personal legal advisor for advice. If Peter is told by his lawyer that the Chairman has acted improperly, Peter must decide how to address this issue with the Chairman and fellow board members. Judgment and common sense here are critical. Peter can elect to inform the Chairman in various ways, including a personal communication, a joint communication with other directors or indirectly through third parties. If I were in Peter's boots, I would have communicated privately with the entity's lead attorney, and tell her that I believed the Chairman's actions as inconsistent with correct board process. I would also indicate that I would hope the Chairman would consider being more transparent and change his ways, and if not be prepared to resign from the board if she or the Chairman felt otherwise. Walter Borda is a co-founder of Borda-Lorenz P.C., a law firm based in Michigan, USA. Peter's duty is to the company and he must safeguard its future. The two immediate problems are lack of day-to-day executive leadership and uncertain funding. To survive the company must operate and remain solvent. Peter needs to work with his board colleagues to develop and implement an agreed solution to the mess they have created. He should consider resigning if he cannot get the board to work together on this. The board must understand the financial position. They need a report into the principle commitments in the funding agreement. They should prepare a cash flow forecast that reflects commitments entered into and the ability of the organisation to pay its debts, given those commitments, both with and without the 40% additional funding. Armed with that knowledge the board can act to avoid insolvency and seek the leniency of the funding provider whilst they scramble to meet the terms of the funding arrangement or to develop a strategy for survival without the extra funding. Many not-for-profit companies have little depth of management and a restructure followed by the loss of a CEO is hard even with a united board and clear direction. Peter's board needs to establish clear guidelines for action in the short term. Someone must be found to act on those guidelines whilst a new CEO is sought. There is no legal problem with a non-executive stepping in to this temporary role (or applying for the permanent one) as long as the whole board support that action. The board will need to become quite operationally focussed in the short term and this is a time when venturing into management territory is justified. Abdicating leadership to junior staff is not responsible delegation! Peter should be aware that taking a strong leadership role may provoke an adverse reaction from the current Chairman. As with many arts bodies, people and their reputations will be important assets for this organisation. Peter must quickly ascertain who is valuable and work to bind the team together around that core. Persuading the former CEO to return could also solve the management and funding provider confidence problems. The Board is in a crisis; I don't think the Chairman should directly authorize any administrative change as he has clearly overstepped his functional and linear authority defined by his role. The non-executive directors have made a second mistake by splitting the organization without the two lead executives being present. Any organizational restructuring proposal has to have a buy-in from the management, and probably this may be one of the reasons the CEO is feeling disempowered and decided to move out. What I don't clearly understand here is how the NEDs thought or were convinced that this restructuring would expedite progress without having any clear plan from the management. The third and the most important aspect ignored by the board were the conditions of funding and the expectations of the donors. What were the progressive milestones agreed between the management and the donors? What was the time line agreed for these milestones? It is now imperative that Peter should raise this flag, request a board meeting and review the board's decisions. He should also propose the creation of a Board Charter to define the role of the board along with the exact authority of the management in running day-to-day affairs of the organization to avoid a similar situation occurring in the future. Neelofar Hameed is a Company Secretary for International Industries Ltd and International Steel Ltd. She is a USA Certified Director and is based in Pakistan. Presenting to Boards - This issue of the newsletter has focused on how wrong things can go when discussion in the boardroom fails to focus on potential outcomes that support the board in taking the best decisions to ensure the ongoing survival and success of their enterprise. 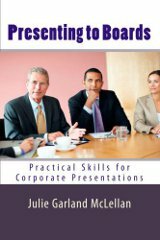 Presenting to Boards is the only book that provides practical assistance to improve the effectiveness and cut-through of board presentations to increase the likelihood of presenters achieving their desired outcomes. Book review - Board discussions usually begin after directors have read a board paper with key information about the topic and any decision that is required. Unfortunately the papers are often poorly written and difficult to understand which makes the job of the board much harder than it should be. This month I have reviewed Mark Treddinick's 'Little Red Writing Book' which will help any writer to improve their communication and persuasion skills. It is also a beautiful and thought provoking book that is rewarding to read. Nothing is impossible, the word itself say's 'I'm possible'! Farewell until the next issue (due 1 November 2012).